Home » Family Life » Road Trip! This last week, after two years of saying we were going to do it and a few hours of actual planning, we took the first non-family visiting vacation since we got married (10 years ago). Our new van needed a shakedown so a four day trip to National Parks in the Four Corners area with eleven of the twelve seats filled was just the thing to do. 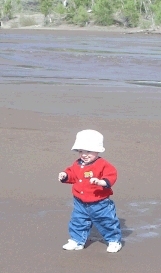 Right before this trip Peter decided that he was perfectly capable of walking everywhere. Six inches at a time. In random directions. So we of course forgot to get out the backpack and instead decided that Peter could walk a mile across soft sand and a shallow river. This took a long time even though we carried him across the river. You didn't think we would actually let him walk across, did you? 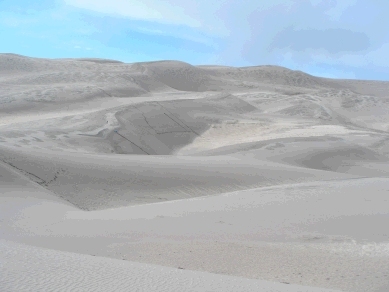 The Great Sand Dunes are a very bizarre land form that rise out of prairie grasslands at the base of the Sangre de Christo Mountains (Blood of Christ Mountains for those who don't have a little la raza in them). 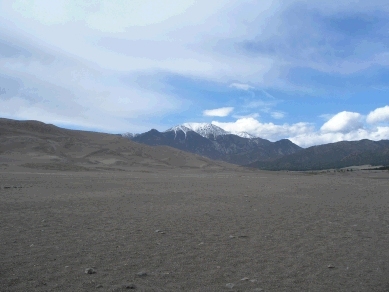 The dunes are formed by a combination of strong prevailing winds against the mountains and the seasonal river that brings eroded soil down onto the plains at the base of the mountains. This cycle dumps drifts that can be a few hundred feet high right at the base of the mountains in something that looks like it's a Hollywood set for Lawrence of Arabia. The kids had a great time climbing the dunes even though the wind occasionally made them feel like they were in a sandblasting machine. 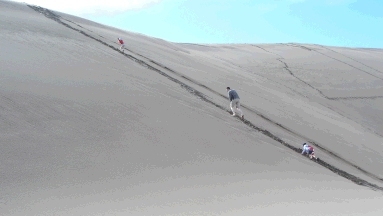 Climbing the dunes is about as good a workout as you can get. The sand is just barely hard enough for you to make upward progress but soft enough that you don't hurt yourself when you lose your footing and fall down the dune. We had dinner at Oscars, a wonderful Mexican restaurant in Alamosa that has been run by the same family for over thirty years. The food isn't fancy but the prices are good and they use real New Mexico chile instead of the weird stuff you find in Tex-Mex food. We stayed at a Super 8 motel which was neither super nor 8 of… well, whatever 8 is supposed to stand for these days. Since this was our first real road trip we didn't realize that our two youngest children morph into demonic banshees at night when they are let out of the hermetically sealed atmosphere in our house – kind of like gremlins. Peter refused to sleep and just stood in his crib screaming. The neighbors kindly knocked on the wall to try and distract him but it didn't work. Especially when Susan started knocking back. So, Daddy and Peter got to find out how comfortable it was to sleep in the van. Peter had the upper hand since he sleeps in his car seat regularly, usually dropping off two minutes before we get home. He quit screaming as soon as I buckled him in his seat and fell asleep in about twenty minutes. At this point I proved that I have bouts of delusion because I thought that I could now take him back inside and get some sleep. After I got back in the room Susan decided that asking for water every fifteen minutes and kicking her sister were a great way to pass the time. At the third water request I said no and she went insane. I took her outside so she could wake everyone up instead of just our neighbors and forgot my keys. After about ten minutes she quieted down enough that I could get the van keys and take kid number two to the van for a nap. She fell asleep quickly and I think I got about an hour of sleep in the driver's seat before finally going back inside. Breakfast was a “continental” European treat – rubbery hard-boiled, prepeeled eggs in a jar of yellow water that must have come from a horror movie set before being snapped up as a delicacy by “Super” 8, english muffins that the English, with all their culinary excellence, would have rejected, brown water labeled as “coffee” and danishes that will probably cause an international incident if the UN finds out. Bon apetit! 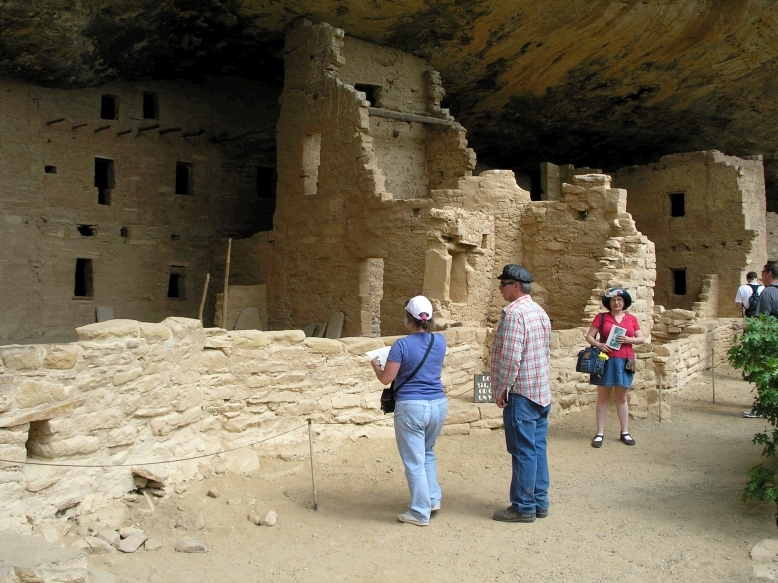 Today's itinerary was a loop through New Mexico to Aztec National Monument, the 4 Corners tourist trap and finally coming back to Colorado to stay at the Mesa Verde Motor Inn in Cortez, CO.
To get to Aztec you have to take a drive through Pagosa Springs and over Wolf Creek Pass which is a gorgeous drive. One of the most fascinating parts for the kids was the runaway truck ramps on the back side of the Pass. 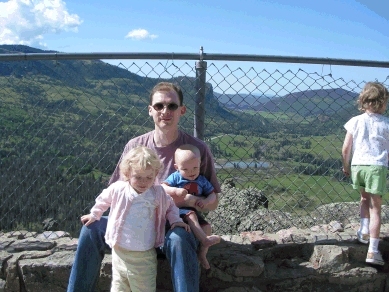 This picture is a view at a scenic overlook coming down the Pass. One of the nicest things about this trip was being able to stop at places like this for a few minutes instead of having to drive straight through to make it to a destination on time. We should do trips like this more often. Because we didn't think we had enough sand in the car, hair, shoes, etc. 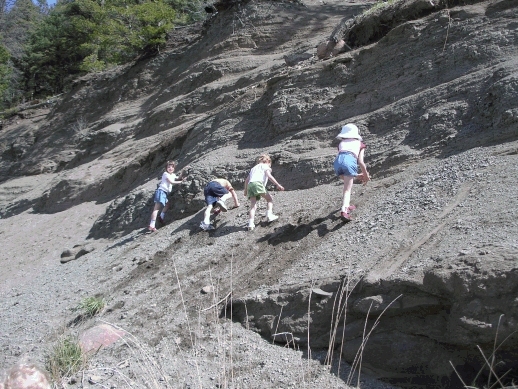 from the sand dunes, we let the kids climb up the hill at the overlook. This dirt was much better because it had the consistency of ash. Oh, well. The kids had fun. Our main destination was Aztec National Monument, a large Indian village from the 1300's that was called Aztec by archaeologists because it had absolutely no resemblance to or connection with the Aztecs except possibly for trade. The most interesting thing about this site is that the wood used to build the great kiva came from Colorado. 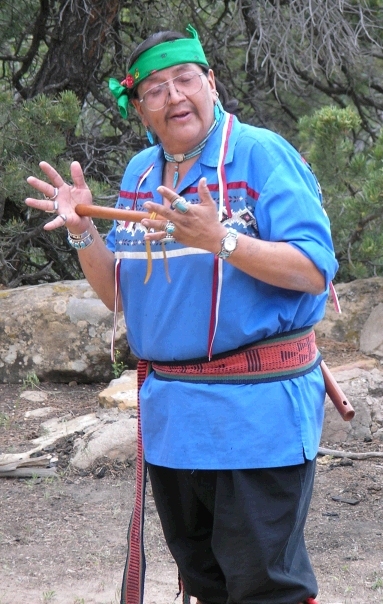 The Indians appear to have hand-carried aspen and pine trees from the mountains in Colorado to the site even though there are plenty of local trees. It's just more proof that Colorado is one of the best places in the US to live that Indians knew, even before there was a Colorado, that things from there are better than anywhere else. The other surprising thing we learned is that Andrew(5) can read. 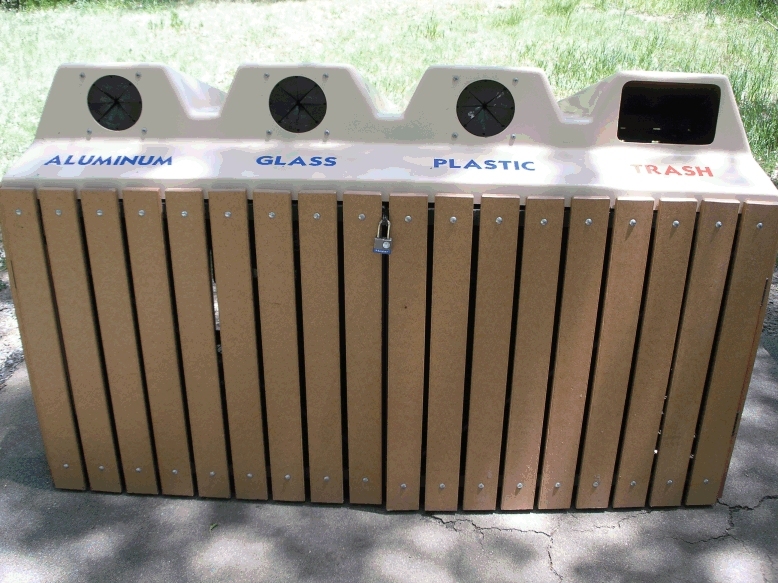 We asked him to throw away the beer bottles from our probably illegal picnic lunch and he picked the right recycling slot. I asked him how he knew which one to use and he said “because it says beer”. You will need to see the enlarged version to understand how incredible this is. Then it was off to the gift shop across the street where a white guy sells Indian ceremonial materials (feathers, skins, etc) and Chinese junk made to look like authentic Indian tourist junk. We ended up with a Chinese Indian doll, a Chinese Indian horse and a Chinese Indian Bow and Rambo knife (they come as a set). My wife got some actual Indian sandpaintings which will become the kids Christmas ornaments this year. The owner said he used to carry authentic Indian toy tomahawks but after a kid dropped his brother like a rock in the store with one he decided against it. 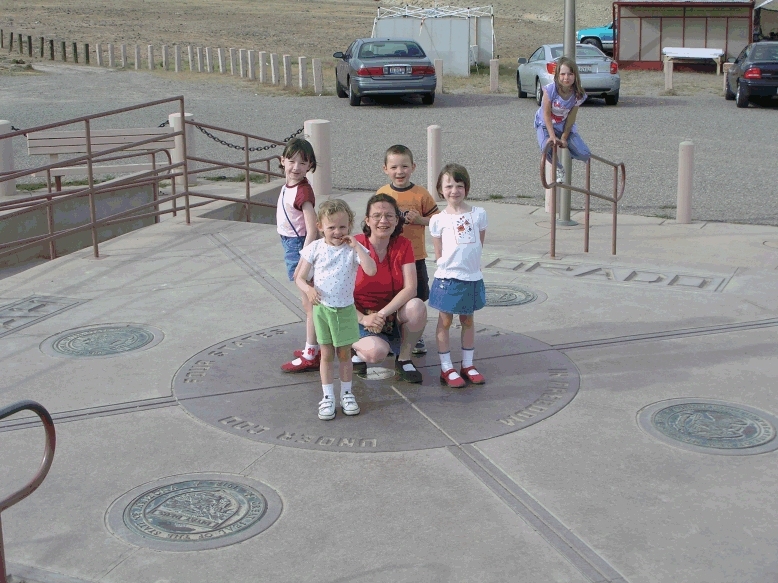 Next it was off to 4 Corners where you and every Harley Rider in America can drive or walk around the bronze disk in the middle of the road and get that unique feeling you only get when driving through four states in five seconds. The child climbing on the rail isn't one of ours but probably wouldn't have seemed out of place if she had climbed in our van with the rest. There were several Indian vendors selling silver and turquoise jewelry and a t-shirt shop selling Colorado trinkets. The funny thing is that the Ute Indian Reservation occupies the land in three states here but for some reason doesn't extend into Colorado. You can see the dividing line by noting the end of the vendor booths. The only thing on the Colorado side is the t-shirt shop and the visitor's center which we didn't go in because it has been “condemn”. After taking in the verdant dirt countryside that seems to be a requirement for Indian reservations, we went on to Cortez, named after a character in a Nintendo game, to find our lodgings for the night. The first view of the Mesa Verde Motor Inn made us wonder if we had just stepped back in time to the 1960's and the website does have that Route 66 nostalgia as well. Actually, we weren't really sure what the name of the place was since all the official signs said “Anasazi Motor Inn and Convention Center” and the banner hanging on the sign said “Mesa Verde Inn.” I guess it doesn't really matter. You don't stay somewhere just because of the name, do you? Because of the nostalgia that the place seemed to ooze, my mom and I thought we should go take a look at a room to make sure that James Dean hadn't died and been left in it. Surprisingly, the rooms were clean and not done in shag rug deco. After the sleeping horror of the night before, we decided to put the kids to bed and go for a walk so that only our neighbors would have to listen to Peter scream. This turned out to be a great idea because without mom and dad around, all the kids fell asleep quickly. Breakfast was an even better surprise as 1) it was included in the price 2) the word “continental” wasn't used to describe it 3) it was served on real plates at tables with tablecloths and metal silverware. The food was good and a much better way to start a long day of hiking through Mesa Verde instead of the standard “continental” fare. Since it was Sunday we went to St. Margaret Mary parish in Cortez for Mass. The church was nice looking, the congregation tried to sing and if you could ignore the homily, was pretty nice overall. The funny thing about the parish is that it is obviously in a tourist town. The diocese of Pueblo, like another diocese I mentioned before, never got the memo about the new GIRM so you could easily tell who was visiting because they all knelt at the right times. 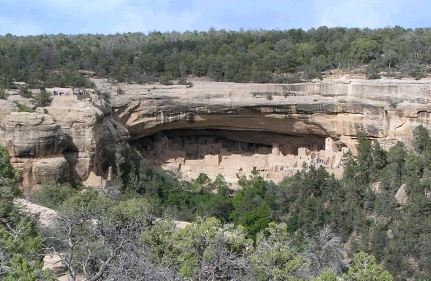 Mesa Verde is an impressive National Park. It covers about 70,000 acres on the top of a mesa and unless you are right on top of the actual ruins, could be any other mountain. 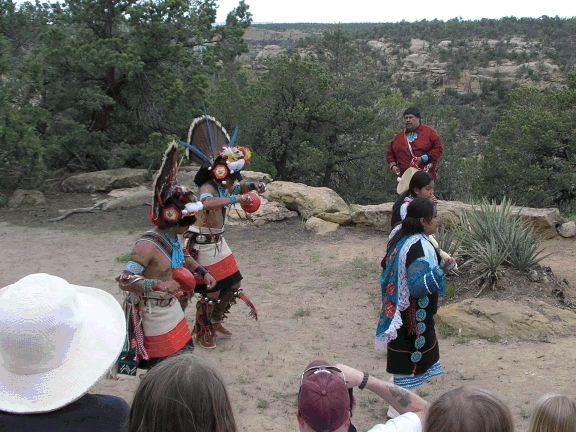 Our visit coincided with some sort of festival so there was this troupe of dancers from the Hopi reservation demonstrating some of their dances. Most tribes won't let non-members view their ceremonies but this tribe will let you watch and record them as long as you don't try to make money off of it. Even so, they said that they make some changes to the dances that they show publicly for religious reasons. Keep this concern for the sacred in mind when you read through day four of our trip. 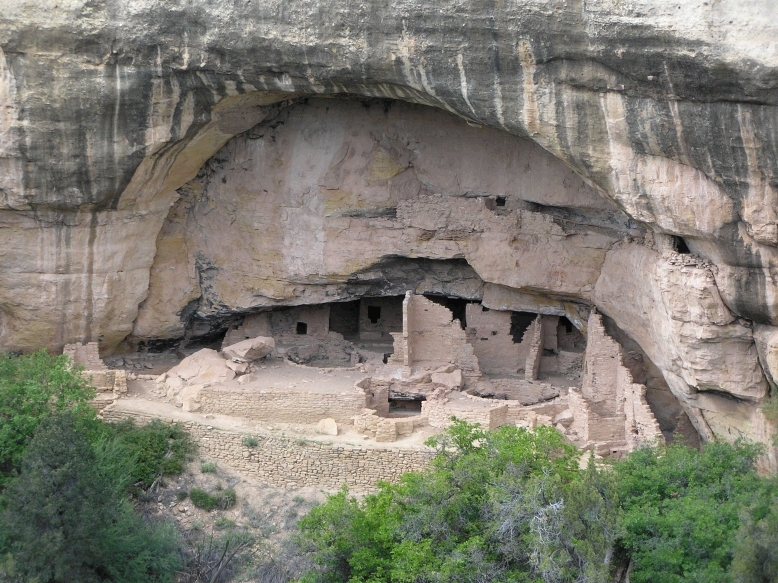 The actual ruins on the mesa occupy over 4000 different sites so we stuck with the easiest to get to. Being five-months pregnant kind of precludes my wife from climbing ladders into various dwellings in the park. That's Paula on the right. 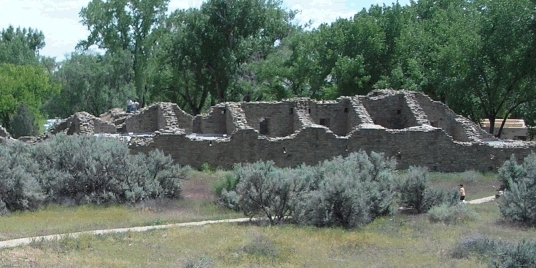 The area was inhabited for around 700 years ending in the 1300's, possibly due to an extended drought. Another drought led to the most striking thing about the park today – the devastation from a pair of wildfires back in 2000. Almost the entire drive through the park takes you through the skeletons of trees left by these fires. The visitor's center sits at the very top of the mesa and the fire came within a few yards of it on every side. There is a picture inside of fire trucks in the parking lot surrounded by walls of flames. After the short hike down to Spruce House, we took a leisurely drive through the park to see some of the other cliff dwellings from a distance. A funny thing about the whole trip was that we ran into people we had seen in different places. My parents talked to an elderly man in the middle of the river at the Great Sand Dunes who was visiting from Great Britain and he turned out to be next door to them at the Mesa Verde Inn the next night. We also passed by a family at Spruce House that we had seen at Mass earlier that morning. We had a picnic dinner in Santa Rosa park in Durango on our way to the Econolodge in Pagosa Springs for the night. 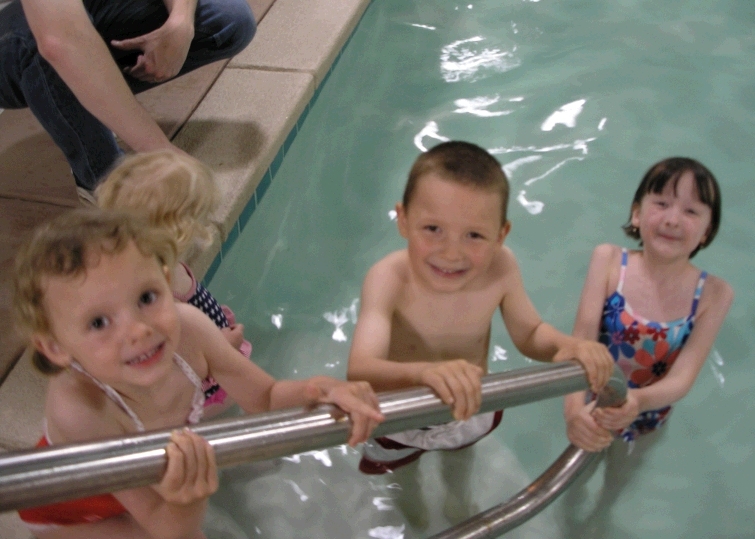 The most anticipated and asked about part of the trip happened at the Econolodge – swimming in the hotel pool. We used the same sleeping strategy as the night before – drop in crib and run – and it worked again. We were subjected to another “continental” breakfast in the morning served by someone who my mom said looked like an ex-KGB agent. He was certainly Eastern European and scowled all the time. Our last day of the trip took us to Antonito and San Luis for visits to some Catholic sites and a drive by of the log cabin where some famous boxer grew up. 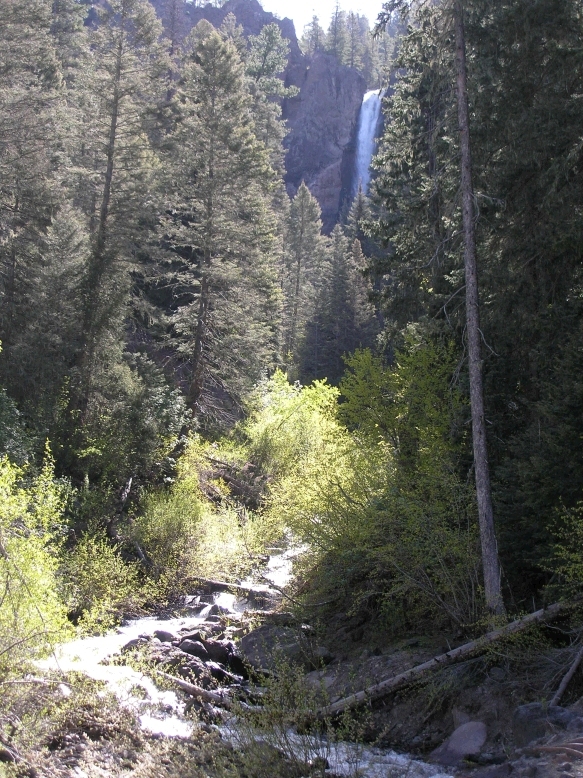 Before getting to the main attractions we stopped to look at Treasure Falls which is at the bottom of Wolf Creek Pass. We had seen this on the way down the mountain and decided to actually get out this time. I'm glad we did because those chipmunks sure looked hungry for all the goldfish crackers they got. Upon reaching Antonito we stopped at the departure station for the Cumbres and Toltec Scenic Railway. 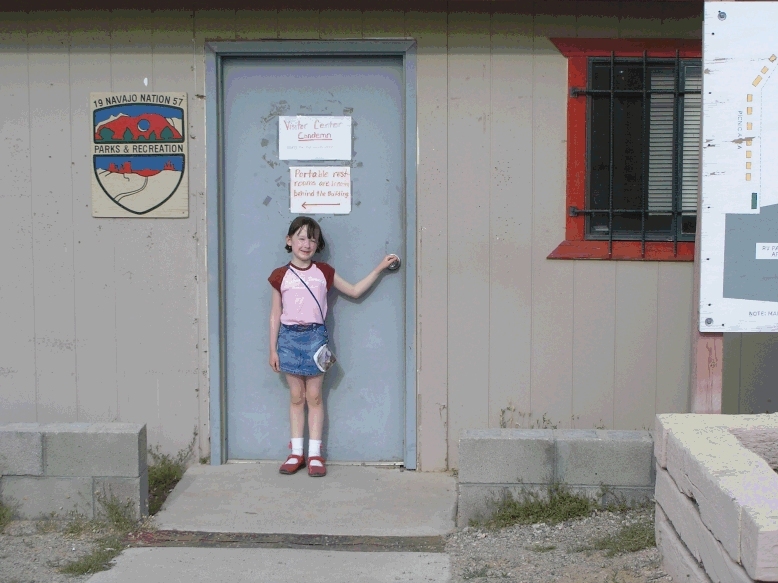 This used to be a favorite stopping point on our way to Bandelier National Monument in New Mexico when my aunt and uncle worked there. They have an old steam engine and coal car on display that we used to love to climb on. Unfortunately, the railway seems to not be doing so well as the station is not being maintained and the exhibit train has fallen into disrepair. The kids still had fun climbing on it but somehow I didn't get a picture. Our next stop was Our Lady of Guadalupe Church in Antonito. 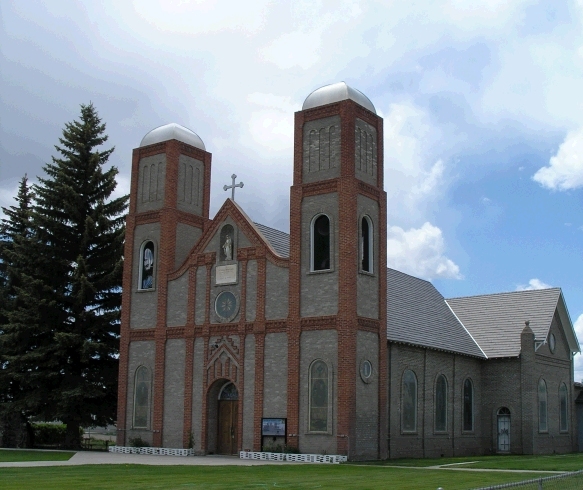 This is the oldest Catholic church in Colorado and was founded by the Jesuits but don't hold that against the parish. It's a small brick building that was rebuilt about 100 years ago after a fire. Looking at the finished product proved that you can make something beautiful without a big budget. We also found out what you do with a beautiful old pulpit that you don't use anymore – hang cheap plastic banners from it. The church has very nice stained glass windows that don't seem to be in the standard European style that most churches from this time period have. Maybe they were made in the States. We decided not to press our luck by opening this door. I guess the parishioners don't either. After leaving Antonito we headed to San Luis to visit the famous Stations of the Cross. These bronze sculptures form a “living” Way of the Cross that goes up a hill to a shrine from the parish below. This is a view part way up the hill. Each of the statues is very well done and about 3/4 life size except for the crucifixion which seems life sized. Next to the shrine is a new shrine dedicated to the Mexican martyrs. The entrance to the new shrine is marked by a wall covered in black and red paint splatters representing the execution wall where many martyrs such as Miguel Pro met their Saviour. When we got to the top of the hill we noticed that there were pews outside and water bottles around like there had been some kind of talk earlier in the day. We didn't pay much attention while we wandered around the hillside until we had to go through the area to get into the main shrine itself. It turns out that there had been a dedication Mass at 10:30am that morning for the new Mexican martyrs shrine and everything had just been left outside! We got there around 4pm so the hill had been abandoned for several hours. The altar and lectern (with relic stones in each) from the main parish church at the bottom of the hill were just sitting out there. The altar cloth was flapping in the wind, held in place by two pins. One of the two thuribles left outside had fallen over. One of the altar candlesticks was lying on the ground along with the Knights of Columbus banner. A water pitcher and bowl had been left on the credence table and the reliquary of all the martyrs had been left unattended on the altar in the chapel. The bishop of Pueblo and the bishop of Chihuahua had been in attendance at the Mass and the program did list individuals responsible for cleanup. After thinking back to the concern the Indians took to their religious ceremonies and the seriousness that the martyrs who were supposedly being honored at Mass that morning took to their Faith, it was almost comical to see how little reverence there is for the Faith and sacred objects today. We ended up hauling most of the items, including the altar inside the chapel so at least they wouldn't get rained on by the approaching storm. After this downer we got back in the van and made it home safely. Sleeping in my own bed that night would have been wonderful except for the knowledge that I had to get up at 3am to go to a trade show in Chicago the next day. All in all it was a great trip that I hope my kids remember fondly. Our van didn't have to work hard climbing the mountains and got 18 miles to a gallon which is pretty incredible considering the size of the vehicle, the number of passengers and air conditioning over mountain roads. Most of my best memories are of family road trips to national parks so I was happy to carry on the tradition. The CBPA just doesn’t get it do they? I’ve never understood how someone can say they are Catholic and yet work against the Church. They are in need of conversion, penance, forgiveness and redemption. Let’s remember them in our prayers. Michael Leach – Lifetime Achievement – for telling Catholics that they can pick and choose – for promoting Cafeteria Catholicism?? Doesn’t sound like the Catholic Book Publishers are representing orthodox Catholicism – does it? and they sound so concerned over your well thought out letter.